By Fathom | In this year’s edition of the World’s Most Romantic Hotels, we’re celebrating the third wheel. Too often maligned as the wedge that can drive you and your beloved apart, we’d rather think of the third wheel as the force that draws you together, the shared passion that cements your bond. Remember, you’ve a big heart and a whole lotta love to give. Tordrillo Mountain Lodge.Photo courtesy of Tordrillo Mountain Lodge. What’s to Love: A multimillion-dollar revamp by thrill-seeking owners (Olympic gold medalist Tommy Moe and Alaskan heli-ski pioneer Mike Overcast) takes the heart rate to new heights at this five-star, multi-sport wilderness lodge. 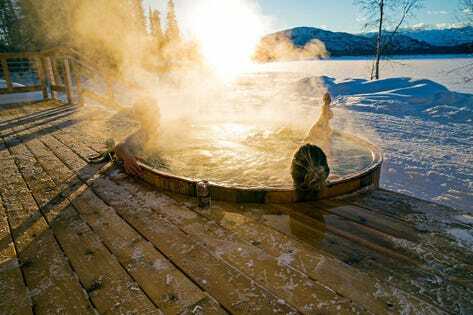 A 40-minute floatplane flight from Anchorage lands guests in the remote Tordrillo Mountains, where stylish digs, fancy chefs, a lakeside sauna, and in-room massages round out helicopter-based adventure experiences all year long. An accomplished guide team leadshttps://blogs.forbes.com/fathom/ guests in skiing and snowboarding through steep gullies and powder fields. Summer calls for glacier hiking, wake surfing, waterskiing, wildlife viewing, and catching the Northern Lights at night. Hotel Esencia.Photo by Tanveer Badal. What’s to Love: You land in Cancun and drive an hour south. You turn left into the edge of the jungle and are escorted via golf cart through a thicket of vines — cue the peacocks calling out their welcome — emerging onto the quietly grand former estate of an Italian duchess, who you’re told built this place to be near her lover. You pass turtles swimming a small cenote, pause for afternoon tea in the sitting room, and check into your room — a sea of white punctuated by a colorful pillow, a dramatic palm frond. Two pools await, as does a secluded beach along a gentle bay. Go-go Tulum is close by, as are excellent archaeological and ecological sites, but if all you want to think about is morning yoga, another bottle of Casa Madero rosé, the guacamole and tacos at Mistura restaurant, and getting back to the day bed along the shore, you’re making the right decision. Villa Tre Ville.Photo courtesy of Villa Tre Ville. What’s to Love: If you’ve ever fantasized about dating — or being — Marcello Mastroianni, you can take dolce vita dreams to the next level by checking into the Amalfi Coast cliffside estate that was the home of legendary Italian director Franco Zeffirelli (yes, the one who did Romeo and Juliet, speaking of romance…). He spent decades restoring and designing the cliffside property so every striking detail is infused with drama, resulting in spaces that look like Italian and Moroccan stage sets and rooms named for pals like Maria Callas and characters like Tosca. Aperol spritzes appear out of nowhere, the swimming is fabulous, and the hotel’s skiff will whisk you off to Da Adolfo for lunch or to Positano for a pizza at the drop of a hat. The Lowell.Photo courtesy of The Lowell. What’s to Love: Evoking everything that’s wonderful about old-school, discreet uptown, the intimate boutique hotel feels so timeless that it would be so easy to ignore Central Park and Museum Mile (mere steps away) and lose yourself inside. Start with cocktails at Jacques Bar, followed by a Mediterranean-infused French meal at Majorelle. Settle for a nightcap in the deep sofas in the Club Room, then wander upstairs, where their fireplace is roaring at the foot of your bed. Wake up, have room service on the terrace, and do the whole thing all over again. Six Senses Yao Noi.Photo courtesy of Six Senses Yao Noi. What’s to Love: If you want to stay in the jungle and live like Swiss Family Robinson meets Richard Branson, stay here. This place manages to combine the luxury of good bedding, good food and beverage, an all-day ice cream parlor, and a superlative spa with the mystery and authenticity of a Thai jungle. The materials are all natural (there is a huge focus on sustainability and local craftsmanship) and there’s not a single piece of plastic in sight. Hop on a tuk tuk for a ride around the teeny island to see rubber plantations, rice paddies, a modest market, and the jade green sea, or take a boat out for a day to enjoy limestone cliffs and a warm dip. A bottle (or two) of the Six Senses local (yes, Thai wine!) rose makes lunch that much more special. Taylor River Lodge.Photo courtesy of Taylor River Lodge. What’s to Love: Open from late May through mid-October, the off-grid locale deep in Taylor Canyon is a woodsy wonderland perfect for families. There are private cabins with various set-ups — lofts, bunk beds, kitchens, and a teepee lounge. The all-inclusive rate includes not only food and drink (and an awesome mini bar), but activities like river rafting, axe-throwing, fly fishing, mountaineering, shooting BB guns (you’ll shoot yer eye out, kid), and access to the beautiful pool cabin. What’s to Love: A boutique hotel in the heart of picturesque Provence with luxurious surroundings — gardens, pools, and five distinct buildings with chic simple rooms — and one of the most wonderful restaurants anywhere. Sit outside in summer and savor fresh vegetables from their garden or sip Petrus in the 50,000-bottle wine cellar. Whatever the case, you need never leave this picturesque property. A weekend here feels completely restorative. Ill Sereno.Photo courtesy of Ill Sereno. What’s to Love: Set on the shores of Lake Como, this Patricia Urquoila-designed property is all stone and glass — elements that won’t compete with the surrounding natural beauty. Rooms feature floor-to-ceiling windows and minimalist furnishings to maximize those views. The infinity pool is a thing of beauty, as is the hotel’s fleet of classic boats that were handcrafted by local artisans and boat-making legend Daniele Riva and feature the old-school aesthetics of classic lake boats updated with Urquoila’s chic fabrics and finishes. Aurora in Bed.Photo courtesy of Off the Map Travel. What’s to Love Is this a dream you’re living? You’re sleeping outdoors on a rooftop, cuddled under duvets, watching the Northern Lights stream and dance overhead. You’ve checked into the recently renovated Villa Telegrafbukta, which can sleep up to six, should you feel like sharing. If you haven’t pulled all-nighters under the galaxy, you can spend days exploring fjords and islands. This is available only through travel Off the Map Travel from available September through March, through December through March is the best time to see the Northern Lights. The Alpina Gstaad.Photo courtesy The Alpina Gstaad. What’s to Love: Set in the Swiss Saanenland, the uber-chic boutique hotel has a traditional chalet vibe and is the height of farmhouse luxury. The sumptuous spa is all natural wood and stone — no gilt here! — and does everything from color therapy and salt treatments to Green Caviar Facials and killer couples massages in a cave room. This spa is so comprehensive — and so Zen — you’ll feel reborn.